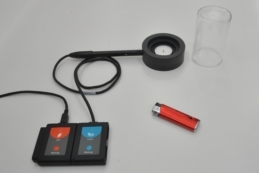 This kit together with an oxygen sensor allows students to investigate the oxygen concentration needed to sustain combustion. It enables the student to clarify the common concept that combustion ends when free oxygen concentration approaches zero and to prove that it is wrong. Using the Gas generator, CO2 is generated and brought in contact with water, which simulates acid rain formation. 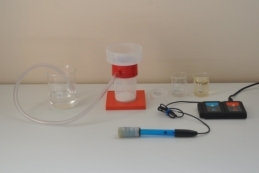 The pH of the water changes and can be monitored using a pH logger sensor. The photosynthesis chamber is designed to contain plants or other organisms. It also has special holes for oxygen and CO2 NeuLog sensors in order to measure oxygen and carbon dioxide changes of respiration and photosynthesis. 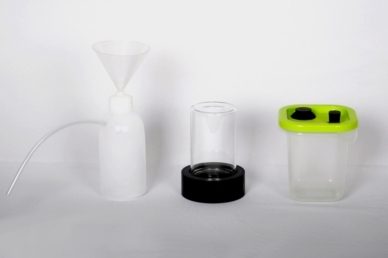 Gas generator, Cover (glass), Candle base, Candle, Photosynthesis chamber, CO2 sensor opening stopper, Oxygen sensor opening stopper.